Please note: if you have any suggestions for additions, please PM an AQW Guides AK or post in this thread. Thanks! Once the amendments have been made, your post(s) will be deleted. 1) What is AQWorlds? How can I get online? 2) Are there rules to govern my actions? 3) What are my basic control panel functions? 4) How do I see the storyline, what I've earned, and other interesting things? 5) How do I interact with the world? 6) How do I interact with other players? 7) Useful Links and Help Functions. AE Staff have golden names above their characters. If someone is claiming to be staff, but does not have a Gold name, then they are NOT AE staff. What is it? What is an MMO? AQW stands for Adventure Quest Worlds, AE's first MMO. An MMO is a massive multiplayer online game where you can walk-around and interact with other players in real time! AQWorlds is an in-browser game, like AdventureQuest, Dragonfable and Mechquest do, requiring only an internet connection, a web browser and Flash player! There are currently 14 servers from which to choose. Normal Server: Is a "Wild West" server. Any player - as long as they have confirmed the email on their game account - has access to full chat. Upgrade-only Server: If you have upgraded your account in AQW, you will be able to access these Legend-only servers while your upgrade is active. All upgraded players have access to full chat. Artix: Normal Server. This server is an international server for all players. Safiria: Normal Server. This server is an international server for all players. Evil Sir Ver: Upgrade-only Server. J6: Normal Server. This server is an international server for all players. Espada: Normal Server. This server was made for the Brazilian AQW community. As such, players are expected to speak Portuguese here. Espada 2: Normal Server. This server was made for the Brazilian AQW community. As such, players are expected to speak Portuguese here. It was replaced by the Espada server. Hidden Grotto: Normal Server. This server is an international server for all players. This is a temporary server designed to stress test new server capability updates. It was replaced by the J6 server. Minimal: Normal Server. This server is an international server for all players. It was merged with the Zazul server. PTR: A separate server designed for testing stats/PvP/New class setups/Guilds. The PTR system has now been released on the other servers. PTR was integrated into the main server select screen for a while. When you clicked on the PTR server in the server select screen, a message would appear saying ''The Public Test Realm (PTR) requires a special version of the game. Do you want to redirect to this version now? You will need to login again.'' Clicking yes would take you to a separate server select screen. If you click the ''Normal Version'' button, you'll be directed back to the regular login screen. It was replaced by the Evil Sir Ver server. Quibble: Moglin-Safe Server. It was replaced by the Safiria server. Samba: Normal Server. It was replaced by the Hidden Grotto server. Talim: Normal Server. This server was made for the Phillipino AQW community. As such, players are expected to speak Phillipino here. Truffle: Moglin-Safe Server. It was merged with the Zorbak server. Warlic: Normal Server. It was replaced by the Nythera server. Zazul: Normal Server. This server is an international server for all players. Where do I turn up once I'm online? You will always log-on just outside the main city, called "Battleon". What are those numbers beside the names of towns? Each area (such as Battleon) has an almost infinite number of "instances". Each map has a limit on the number of players who can be active in order to guarantee the best quality gameplay for everyone. If you are in Guru-15, that means you are in the 15th instance of the Guru map. The number beside it simply refers to what version or room you are in so that you can easily keep track of where you are and tell others to join you. Changing screens within a town will not transport you to a different place but entering shops, buildings, or teleporting to another place will usually change your room number. How does this game relate to Adventure Quest (AE's original game), Dragonfable, or Mechquest? The timeline of Lore currently goes like this: AdventureQuest is five years after Dragonfable but these two are separated by some sort of timesplit. Mechquest is 5000 years before AdventureQuest. AQWorlds takes place in the same universe, but on its own timeline altogether. As with all other Artix Entertainment Games, this one is very user friendly and contains only cartoon violence. Our games are played by a wide range of ages. Please be careful of your language and any actions that you take, as there can be younger players around. Please help keep the environment safe for the younger players! If you see any misconduct, use the Report Feature. Remember, though - the report feature is for serious issues. If someone is bothering you personally, use the /ignore feature first. Like in any other game, you will have a basic series of controls that constantly show up. Please visit the in-game Tutorial area (/join tutor) for a full walkthrough of your entire game screen. Note: with the release of AQW version 1.0, the interface has been updated and the Tutorial area is no longer up to date. If you want an explanation of the new icons in the bottom right of your screen, take a look at the Interface section of the Player Handbook. All of these commands can be seen on Cleric Dawn's scroll outside of Swordhaven. This brings up "To super space alot:" and you can then type your message. This will invite whoever you typed to your party. This will add whoever you typed as a friend - please note that they wont automatically be added to your friends list. This will reply to your last PM. This works for players with or without spaces in their name. /report <playername> Allows you to report another player when you find them to be breaking the rules. allows you to turn off the party system and reject any invites automatically. you will receive the message "Ignoring party invites." in red. turns party systems back on. you will receive the message "accepting party invites" in green. Allows you to see whether or not somebody is on and on the same server as you. 2-5: By pressing the numbers 2 through 5, you can use your available skills in battle without having to click on the icons. 6: By pressing number 6 you can automatically use the current available potion. L: Opens list of quests you are currently on. T: Target. This has 2 uses. If you select a player, and hit T, then you will target the monster. Then, you can simply press the shortcut 1 to auto attack it or you can press the icon. The other use is for those with healing skills. You select the opponent/monster. When you hit T, you will now target their opponent for healing. U: Opens list of users in your area. V: Used to pop-up a health-bar at the top of the characters. The bar is also updating if the characters loss or regain health. Clicking on your character's profile in the top left corner of the screen, and selecting "Char Page". If you are friends with somebody, and they are online, you can click on their name on the Friends List Pulldown and select "Char Page". It allows you and other people to view what items your character has in his/her inventory and view what that persons character has equipped. Legend only and AC items have a color tag. AC items are in orange and Legend only items are purple. You can determine what the person's character currently has equipped, by looking at the "Items Equipped" area of the Character Page. Your character will also have displayed their alignment; Good, Evil or Neutral Hero. They also show "Achievements" that your character has done. A list of all the achievements can be found below. A list of all available character page badges can be found here. How do you get to Character Pages out of game? What does everything mean? You can get to your character’s page by going on the game and clicking on any character’s (including yours) profile at the top left corner after you click on that character. If you want to see someone else’s character page who is currently online, type their name in at the end of the URL. If there is already someone’s name in the URL box, simply take it out and replace the two names. http://www.aq.com/aw-character.asp?id= is the default link to the character pages. Note that this will take you to nobody's character page and you will have to type the persons name in. Here is a list of how much experience is required per lvl in the game. This is for your overall lvl, and not for your class level. The current level cap is 85. You may ask, what's the point? Well certain items require a specific rank/level of reputation for you to purchase them. so you can purchase it. Also, reputation is permanent, meaning once you get it you cannot lose it. use. If you don't have a high enough Dwarfhold Rep Rank then you can't get the item. How do you get Dwarfhold Reputation? The answer is Quests. find that Snowbeard's shop will continue to grow with cool new higher-rank items as the area and the story of Vath, the Chaos Dragonlord progresses. The bank is and extension of your bag. It holds your items for you, but the only downside is that you cannot carry them around with you. It is good if you wish to have more bag space, or if you want to have more items. To open a bank for your character, simply go to Valencia in the middle of Battleon. It will cost you 200 ACs for one bank slot, 50000 ACs if you wish to have all 250. That is 250 bank slots that hold Legend and free player items that are worth Gold. If you purchase any items with ACs (Adventure Coins), then you can store all of them for FREE in your bank. The bank can hold an INFINITE amount of AC items. And lastly I am proud to announce that the BANK IS NOW FREE FOR ANY AC ITEM! Starting today, you can drop any AdventureCoin item into your bank for FREE, and it will hold an INFINITE number of AC items. If you want to use the bank for normal Items you still need to pay the initial 200 AC fee for your first 20 normal inventory spaces, AC items will slip right past that. If you want you can JUST use the bank to store your AC items and never pay a single AC for space. This Bank upgrade is for ALL players, Legend and free player alike. To access your Bank, just talk to Valencia in Battleon, click the BANK button and just start moving Adventure Coin items into storage! Bank and Inventory Issues: 1. Some people have been posting about losing bag slots. What is happening is this - empty bag slots are no longer visible. Say you have 40 slots purchased, but items in 35 of them. You'll only see those 35. You haven't lost the other 5 - you can add items to them as necessary. The book of lore is your key to the storyline. It shows what you have and have not completed. You can access your book of lore from your Interface by clicking on the picture of the book. Once you click on the book it will load into the middle of the screen. After it loads simply click on the book to open it. The opened book will have banners to interact with. Story- The Story tab lists all of the parts of the storyline so far. Click on the part of storyline that you would like to do and it will transport you to the beginning of that saga. If you have completed a saga it will turn gold, whereas uncompleted sagas will remain silver. For help with the storyline, please see the Storyline Walkthrough! guide. Quests-The quest tab provides you with side quests that you can do. Percentages are shown for how much of a quest chain you have completed. Not all quests can be done as some are for Legend only and others are rare. All available quests can be found on the Book of Lore's Wiki page. Badges- Badges are like achievements that you have done in game. They are split into three sections: "Achievement Badges" for badges you've earned in-game such as fighting bosses; "HeroMart Badges" for items you've bought and then redeemed from HeroMart; and "Other Badges" for miscellaneous offers such as special offers. If you don't have the badge, it will appear faded compared to badges you do own. All available badges can be found on the Book of Lore's Wiki page. Upgrades- This tab tells you when your membership runs out and how many ACs you have. It also provides you the options to buying a membership or AdventureCoins. Lorepedia- This tab gives you all the information on the classes you can buy from the Class Dealer Shop, and information on the Lorepedia. If you read in the Design Notes that the Book of Lore is getting an update, or has been updated, simply clear you cache and reload the page. Then log into the game and see the update. If you don't know how to clear your cache you can read how to here. Depending on your preference, you can choose to use High, Medium, Low or Auto graphics. Running high graphics will give great visuals, while running low ones will be a bit fuzzier but might allow you to move faster and better help your computer take the load off AQW. If you set it to Auto graphics, AQW will automatically adjust its graphics to give you the best experience. You can choose your graphic quality using the “options” interface in-game. Valencia has full information in her tutorial in-game. Direction of travel (next map) is indicated by arrows on the ground – they tell you which directions have more content. Simply run towards the edge of your current screen and you will automatically move into that screen once you have reached the end of your current one. How do I go to different places? There are 2 ways to travel in the game. You can use the Map of Lore to travel around the world of Lore and view how much of an area you have completed, as well as replay cutscenes. Or you can use the "/join" command. Each town also has other areas to visit: cellars, attics, Towers, shops are just a few of them! Yulgar's Inn -found in the AQW main town – "Battleon"
You also have access to Yulgar's Cellar where you can battle a couple of the world’s many monsters. Along side Yulgar's own shop there is the "Suggestion shop" where you can purchase items that were inspired by AQW's very own players. The verification shop where you can purchase Dragonlord, Guardian, Starlord and Defender class, as well as armors and weapons. 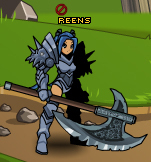 Here you can purchase helms. Low level weapons – levels 1 / 3 / 5. Twilly - Twilly can tell you where to go for enhancements to weapons, armor, capes, etc. Just press the exclamation button over Twilly's head. Explore every town and area thoroughly – you never can tell what you'll find! I have X amount of items stacked, how do I delete them all!? I don't want to click delete a gazillion times! When deleting an item(s), you will be given a box with a sliding bar in it. There will then be a number showing how many of that item you have, and another showing how many you wish to delete. Slide the slider to the right number, then click "Delete". Orcs and Skeletons and Zardmen, Oh My! While in towns or peaceful screens, you will be safe from attack. Once you leave Battleon, though, you will encounter different monsters! As of November 21st, 2008 the Dwakel Crash Site was added to the map. All of the monsters of this area have monster agro. Citadel, added in November as well has monsters with monster agro. This means, if you travel past a monster on the map, they will attack you even if you don’t attack them first. If your health is low, simply type in /rest to your message screen or click the rest button. This will cause your character to kneel on the ground and recover health and mana a little bit at a time. You will continue to kneel even after your health is full until you engage in another action. If you are dead (your health is 0), your screen will have a blue tint and you'll encounter a spawn delay for 10 seconds. When the time has elapsed, you will respawn at the entry point to the zone. Emotes are pre-programmed actions that your characters can use to convey emotion, ideas, or just have fun. The ones below have Avatar animation included! In order to use them, simply type in certain commands (usually /<action>) into your message box. I don't see the emote that I want! ** These emotes do not have Avatar (your character) animation, and will appear in light grey in the Chatpane. AQWorlds has been given an ESRB rating of 10+. However, keep in mind that due to the chat system, in-game atmosphere may change at any time. The report system is there for any serious issues, but remember – use /ignore first. Many of the reports we are receiving would be better served by simply ignoring that specific player. It is called the "Profile Tab". The image to the left in the profile tab is called an "avatar". It displays your characters head (with a helm or without depending on what you are wearing). Under the avatar is a number. That number is called a level. It shows your character's current level. Note that the current level cap is 60. Next to the avatar, there are 2 lines of text. The above one displays your character's name (Beowolve in this case). The second one shows your class and your class current level. Under the 2 lines of text you can see a red bar and a blue bar. The red bar is called "Health" and it helps you survive in battles. The blue bar is called "Mana" or "Energy" and it helps you use skills. Under the Health and Mana bars there is a number writen with a yellow color. that is your character's gold. Gold is used to purchase items from shops. You can gain gold by defeating monsters and completing quests. The button in the middle can be used to set the chat pane to full height. Experiment with the text and emotes provided in there. Next to the speech bubble is the chat box (the real one). Here you type your message. Note that only Legends/verified accounts can talk in all other servers freely (except for the Twilly, Twig, and Zorbak servers, also known as moglin safe servers). The "Send" button sends the typed text (from the chatbox) to the other players. Of course you can always use "Enter" (from your keyboard) for a faster talk. For more information, take a look at the Chat Functions page of the Player Hanbook. We have also added a global cooldown to all abilities other than AutoAttack. This means that every time you use an ability, all abilities will be on cooldown for 1.5 seconds. This is primarily done to limit burst damage in PvP, where a class with many direct damage abilities such as Berserker could otherwise unload a huge amount of damage on a target almost instantly. The most basic way to talk to other players is to click on the message box at the bottom lefthand side of your screen and then hit "send." This will send a public message to everyone who is in your current screen and sometimes the adjacent screen. 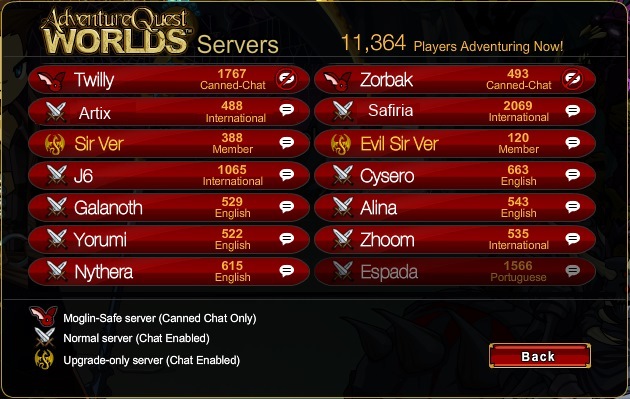 Chat is restricted to Legends and verified players only – however, the Artix, Cysero, Minimal, Zhoom, Safiria, Galanoth and Nythera; “Wild, Wild West” servers have open chat to all who have confirmed their email – even if they have not upgraded in any of our games. What if I want to talk to someone that I can't currently see or send someone a private message? The ">" character will automatically reformat the text entry panel the way "/w playername" does, except that it preserves spaces in the player's name. This will only send a message to the person who last sent you a private message. If you want to start a party with your friends, you can invite them to join your party by clicking on their character and selecting the Invite option in the dropdown menu. Or, you can type in the chat (send) box /invite <player name here> and they will get the party invite. You cannot be in more than one party. If you want to get in to party chat, you type /p and a space. To get out of party chat, you can type /1 and a space or /s and a space. Friends lists have been implemented in the game. On them, you can see all of your friends names and levels. You can have up to a maximum of 40 friends. To invite somebody to be your friend, you can click on their character and selecting the Add Friend in the dropdown menu, or type in the chat (send) box /friend <player name here>. Why can't I friend/party invite/goto/whisper someone? The reason you are unable to whisper/friend/goto or invite someone is because that player has turned off those options in the settings menu. Until that player turns those settings back on the ability to whisper/goto etc will continue to remain off. I can't scroll up to see more messages? You can use your mouse wheel to scroll up to see any missed messages. However, only a certain number of lines remain in the buffer – At this current time an estimate has been provided as being between 90 lines and 3 full pages of lines. Until such a time when this can be accurately confirmed this is all that can be estimated and given. Can I engage in battle with other players? Yes you can! Unlike previous AE games, you will be able to fight alongside your friends, not computer versions of them! Simply choose where you would all like to go as a hunting or war party and all go there. Click on the same monster, and start hitting away! To avoid the phenomenon of Kill Stealing, all players who are active in a battle will receive the same equipment drops. If you are not on a quest, you will not get a quest drop, even though others may. Nono. I meant can I fight other players? Yes! To fight other players go to Battleon and select ''more adventures'' from the game menu, then select PvP! What if I want to make a clan? Guilds have recently been released in AQWorlds. If you are a Legend, you can create a guild. There are 4 positions within a guild, the leader who is the founder, the officers who can also add people to the guild, normal members, and finally duffers who are demoted members without the ability to speak in guild chat. /gd <player's name> Demotes a player in your guild. /motd Shows guild's message of the day. If you want to promote your clan, you should post a recruitment thread in the AQWorlds Guilds after reading the rules. Clans advertising is not allowed in any form, either in the game or on the forums. Recruiters will be warned and their clans punished for misconduct. Please refrain from doing this. AQW General Game Discussion Forums - Generally discuss the game here! All the DNs, announcements are in here! AQW Guides - Here you'll find a collection of FAQs and guides that contain everything you need to know to play AQWorlds! AQW Suggestions - Got an idea for AQWorlds? This is the place to post it! The Official AQW Wikipedia - Looking for the most detailed info on everything in the game? Look no further! A guide on how to clear your cache. Design Notes - Keep up to date on the latest news! Manage your current account - Need to change your email? Need to change your password? Go here to fix it yourself! With the release of AQW version 1.0 came the Player Handbook. It's a very useful tool for players to get used to the changes made. All AE staff will be visible in the game by different color names. Developers have Purple names. This includes artists, writers, coders and anyone else who works on making AQW awesome! Moderators, who read reports and make AQW safe to play have gold names. Player support staff also have gold names and work to ensure everyone's problems are fixed. Dark Red names indicate an individual who helps in keeping AQWorlds safe from hackers and botters. They are known as White Hats, so if you see them in the game give them a /wave! Testers have green names and include both release testers and bug testers. Finally, any other staff member that doesn't fall into one of these categories will have a teal name. The teal name covers a wide range of different jobs, so if you see someone with a teal name give them a little /wave to! For more information on AE Staff name colours, click here. If someone is telling you that they are game staff, if they don't have a Gold name, then they are not. Never give out your password - no staff member will EVER ask you for it. If you find that there are players violating game policies, you may report this misconduct. Do this via the in-game reporting system - remember that the report system is for serious issues only. The /ignore function should always be your first resort. Please do not pm game staff with bugs as they will find themselves unable to respond or carry out their other jobs when inundated with reports. Please use the Bug Tracker for that! Archknights on the forums are not game staff or forum staff. In the game, they are regular players, just like everybody else. In-Game moderators also have the ability to send global messages. If you find that you are seeing [Moderator] messages, then they are for everyone on the server, not just you. Red messages are automatically triggered by the server - if you trigger the filter, or are being told how to use a feature. Here are a few common problems, and how to deal with them. If you think you have encountered a Bug, be sure to use the Bug Tracker. 1) I can't log in! This is a common problem that many encounter. In some cases, it is an issue with your internet connection. In others, the most common problem is that a firewall is blocking the game. If a message comes up that the server is down, or shows that it is restricted to Staff only, then we are in the midst of rolling out new game builds or content. 2) How do I confirm my email? Confirmation email has been successfully sent to your email address. Be sure to check your spam or junk folders in case the email has been diverted into a different folder. 3) My verification isn't working! 4) Why have I stopped getting experience points? This means that you have hit the level cap, which is currently 60. 5) Why have I stopped getting gold? Once you have one million gold, you will no longer receive gold as a reward from killing monsters. However, you can keep selling items from your inventory, including drops from monsters, until you have two million gold, where the max cap is currently set. 6) My account is locked! Help! Currently, the in-game reporting system is quite functional as many players have learned! If your account was locked, this means that you have violated some rule of conduct that you agreed to when you first signed up for the game. Each time a ban is done in-game, you will receive an email detailing the length of your ban. If you find your account locked, be sure to check your email first, before contacting the AQWorlds Help Team. Personater and Lord Xenaphos for all the images! Thanks to Horusmaster9, Darksky, Zamuelnow, Darius, and He11ix for additional information/corrections! If you are dead (your health is 0), your screen will have a blue tint and you will see after 10 seconds a white bar and a message on the right side of your screen: "Respawn". Simply click on that and you will magically live again! You will respawn at the entry point to the zone. It's set to automatically respawn you now. AQW Bugs Forums - Are things buggy in the game? Help us catch gremlins here! Here are a few common problems, and how to deal with them. If you think you have encountered a Bug, be sure to post all the information required in the AQW Bugs Forums. Since the AQW Bugs section is deleted now, I think it should be changed to the Bug Tracker instead. I think that's all I managed to find. Thank you! Some other images need to be re-done. Found under section titled, "AdventureQuest Worlds Basic Functionalities Guide." Found under section titled, "In-game Moderation." All AE staff will be visible in the game by the Gold color of their names. The two statements above are no longer accurate. Staff members have a variety of colors now, depending on their role in the game as outlined here: http://www.aq.com/gamedesignnotes/colorednameguide-5206 . To avoid confusion, perhaps it would be best to update the guide to reflect the recent changes? You should probably add things about the action bar like the menu button, the hero button, the house button (and probably talk about houses in general) etc. The level cap is now level 65. Only /who allows you to see whether or not someone is online. /tell and /w are for sending private messages. You should add that you can use the /duel command to fight someone specific. You can get to your character’s page by going on the game and clicking on any character’s (including yours) profile at the top left corner after you click on that character. If you want to see someone else’s character page who is currently online, type their name in at the end of the URL. If there is already someone’s name in the URL box, simply take it out and replace the two names. http://www.aq.com/aw-character.asp?id= is the default link to the character pages. There is now a search bar on char pages for easily going from page to page without using the URL. I hate to be that guy, but it's buildings.